Take a trip back to pioneer days, with this exciting, educational and engaging experience! Begin our Gemstone Mining Experience with melodramatic storytelling as our own Prospector Joe tour guide tells a tale intertwined with the history of Wisconsin mining. Includes interesting facts about Wisconsin History and Geography. Prospector Joe will then guide guest miners through a mining experience at the Apple Holler Mining Company. Have a “rocking” good time as you roll up your sleeves and sift through your own bag of treasure in our flowing sluice. Discover and identify genuine fossils, gemstones, and minerals that can be taken home. 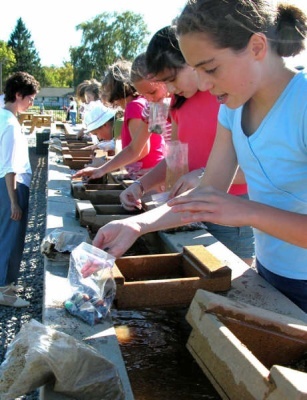 This unique mining experience will be a memorable learning event sure to spark imaginations and the desire to learn more about mining and Geology. Includes Wisconsin Common Core Standards in Science, Agriculture, Agriscience, and Ecology/Environment. 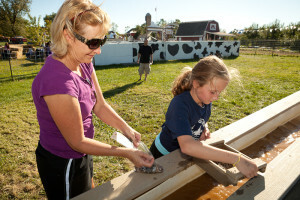 Explore our Farm Park — Farmyard Animals, Kid’s Corral, Crazy Corn Maze, Cow Trivia Maze, Giant Slide, Music Garden & MORE!